I love everything Buffalo Chicken. I love the spiciness of it, and Frank’s Hot Sauce has been my favorite since I was little. So it’s really no surprise that when I saw this recipe, I knew I had to make it. The sweet potatoes give the stuffing an extra creaminess (so you don’t have to use a lot of mayo) with just a touch of sweet that is offset by the chipotle and hot sauce heat. It’s very filling and can go with any veggie or even some homemade French fries. Oh, and it was also approved by the entire family…even the kids! It heats up really well, too. Note: The recipe doesn’t really take that much time to make, but there is a little bit of prep. I put the chicken in the crock pot (no liquid – just chicken) for about two hours to cook because crock chicken shreds in about 10 seconds, and it stays moist. 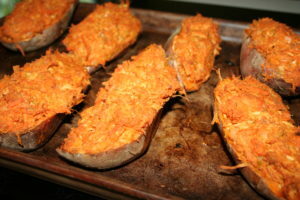 During that time, I put the sweet potatoes in the oven for an hour. That’s just mindless time that you can be doing anything else. Also, I bet you could do this with regular baking potatoes if you’re not into sweet potatoes, but you’d miss out on that simple, sweet taste. Rinse the sweet potatoes and poke with a fork. Place on a parchment lined baking sheet and bake for 45 minutes to 1 hour, until soft. While sweet potatoes bake, heat a medium skillet over medium heat. Add cooking fat and let it get hot, about 30 seconds. Add celery and onion and cook, stirring occasionally. Add carrots and cook for another 5 minutes. Pour into a large bowl and set aside. When the sweet potatoes are cooked, cut them in half lengthwise and scoop out most of the flesh, leaving a thin layer so the sweet potatoes maintain their shape. Add the insides to the onion, celery and carrot mixture. In the bowl, add the shredded chicken, chipotle mayo, hot sauce and spices. Mix, stir and mash until well-combined. Season with salt and pepper to taste. Scoop filling into the shells, evenly distributing. Add shredded cheese, if desired. Turn the oven down to 350 degrees F, and bake for 20 more minutes. Top with toppings of choice, or eat as is!